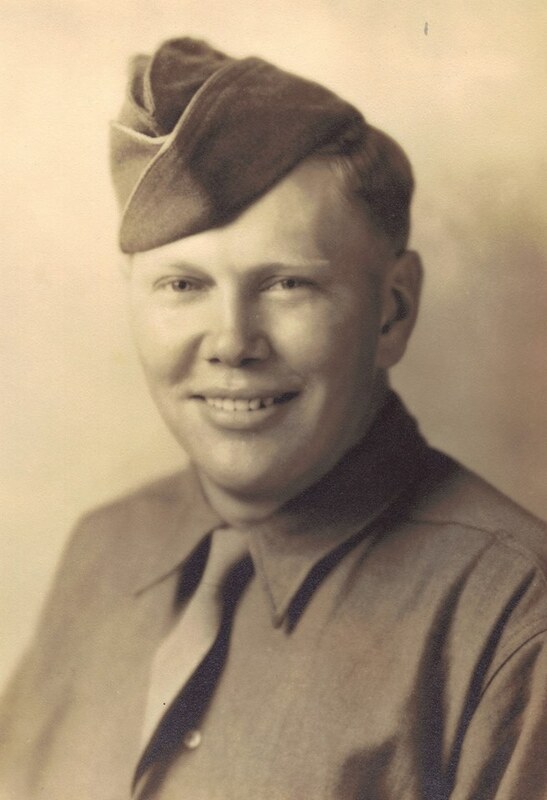 Clarence Andrew Forslund was born on April 16th, 1915 on a farm in Dayton Township, Webster County in Iowa. This was in an area informally called the “Swede Bend”. For Clarence, or “Kelly” as he was called, English was not his first language. All of his grandparents had come from Sweden and Swedish was still spoken by the family at home. After Kelly’s father passed away in 1920, he lived alternately with his mother and with his relatives until finally he and his younger brother Richard were put into a Lutheran orphanage near Stanton, Iowa. The orphanage sent the 2 brothers to live and work as hired hands on farms. At some point, Kelly moved back to Dayton and graduated there from high school in 1933. During the Depression Kelly did whatever work he could find. He worked on farms, for the railroad, and finally for the war industry. While working at a war plant in Burbank, California, he learned he would be drafted, and moved back to Iowa. Here he stayed with his older brother Monnie and his wife and son in Harcourt, just 2 miles west of Dayton. 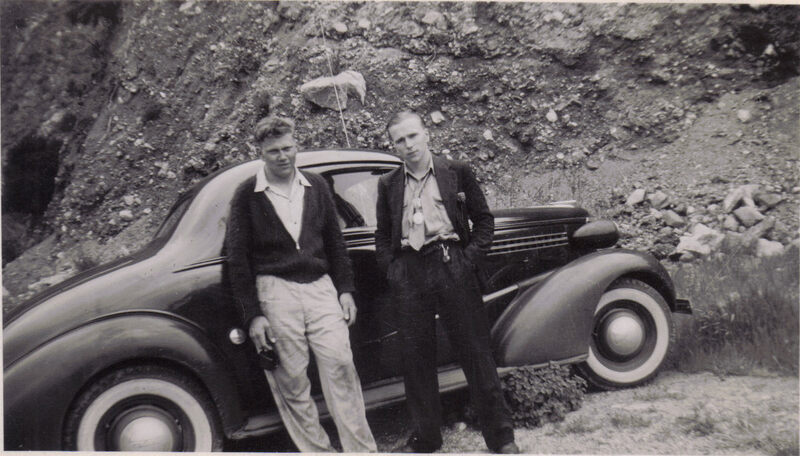 Kelly and his younger brother Richard in California, before Kelly was drafted. During an earlier draft Kelly was rejected (4F) because of flat feet. However, the Army tested his IQ and this was 138! Now Kelly was drafted again, and the US Army took him and placed him in the Infantry, flat feet included. It was while he was waiting in Harcourt to get into the Army that Kelly met Carolyn who was from a local Swedish farming family. 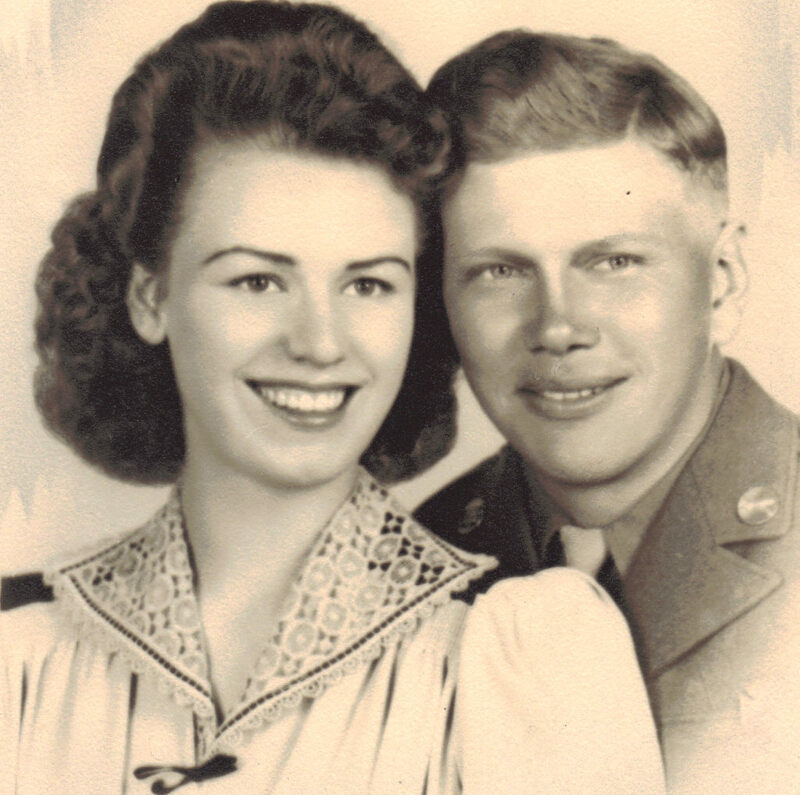 They fell in love, but Kelly was inducted into the Army on September 4th, 1942, taking basic training at Fort Robinson, Arkansas. When Kelly was engaged in Infantry training at Fort Carson in Colorado Springs, Colorado, Carolyn visited him and they got married on December 31st, 1942. After Kelly was transferred to Camp Robbins in California to train other soldiers, Carolyn moved back to Iowa, stayed on her mother’s farm, and gave birth to their son James on September 28th, 1943. Kelly did not see his son until after he was discharged from the Army in the fall of 1945. According to his discharge papers Kelly entered the European Theater of Operations (ETO) on June 28th, 1944. Kelly was now part of C Company, 60th Infantry Regiment of the 9th Infantry Division. From Normandy he fought his way to Belgium. Here an old lady was so thankful to see the American Liberators that she gave them a big cheese. It probably was the best thing she could offer the men, but it was very smelly! While moving forward through Europe with Company C, Kelly arrived at the German border, and participated in the Battle of the Hurtgen Forest. Here he was captured for just a short while. One night the men did not set up a proper camp. They were tired, cold and wet, and just threw their shelter halves over themselves and went to sleep. Kelly was awakened when a German soldier kicked him on the bottom of his boots and said “Hands up!”. Now being a Prisoner of War, they were marched away. Kelly related a story about this to his grandson after the war: “At some point we stopped and our rifles were stacked up across a clearing. Somehow we managed to get to the rifles and shot our way out. A very young German soldier who was guarding us aimed his rifle at me, fired, and missed”. Kelly even saw fire coming out of the barrel of the German rifle..but somehow the German soldier missed. “The young German soldier desperately fumbled with his gun, trying to reload it so he could fire again, but did not manage to do so in time and I shot him point blank“. In later life, shortly before Kelly passed away, he told his family he had never forgotten the young German soldier’s face. It haunted him. According to his discharge papers Kelly left Europe on October 26th, 1945. He returned to Harcourt to his family where he could finally meet his son James for the first time. His first daughter Judith was born in 1946, and in 1948 another daughter was born, Jacqueline. After the war Kelly worked several jobs and then was a Postmaster in Harcourt, Iowa. His brother Monnie had a hardware store which was next to the Post Office. The family lived in a farmhouse on 8 acres, right outside of town, and the all lived a good life. In 1957, the family moved to Colorado where Kelly worked for the Post Office in Denver until retiring in 1985. Clarence Andrew Forslund passed away on July 1st, 1996. Kelly developed trench foot while in combat, as well as gum disease that caused him to lose all his teeth, and he had persistent nightmares about combat for the rest of his life. He was never wounded so he did not receive a Purple Heart. Kelly is a good example of one of many men who went to Europe to fight the war to liberate its people from the Nazi Occupation. He did fight for his country and helped to give many people their freedom back. He was known to be a very kind man who never bragged and was very well liked by everyone. Clarence will forever be remembered.